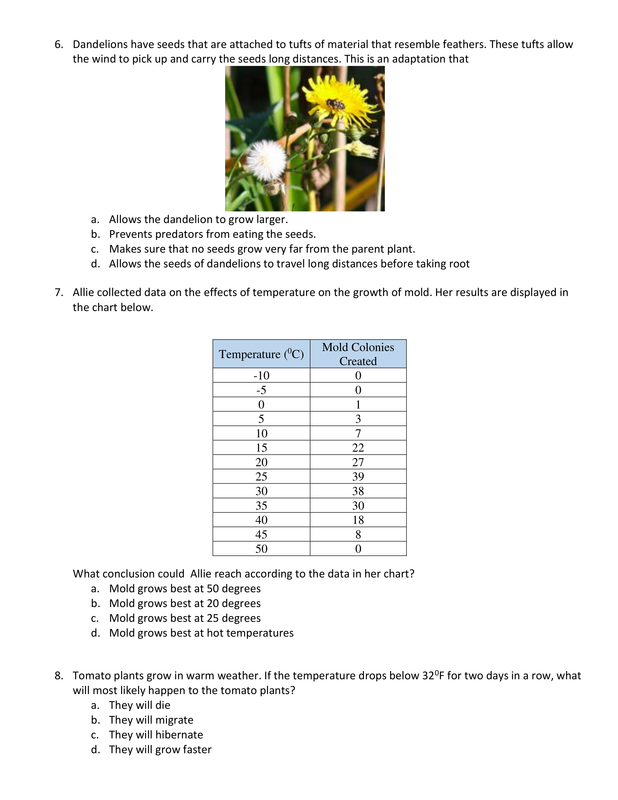 Students are learning about plant reproduction and how animals affect the probability of growth. They are in groups of three and examining four different pictures of seeds. Use the pictures below to answer the questions. Which of the pictures above would bave specialized structures that would increase the likelihood of being pollinated by an insect? Consider the same image in question 2. Based on what you can see in the image; which organism has evolved to rely on animal to spread it's seeds? 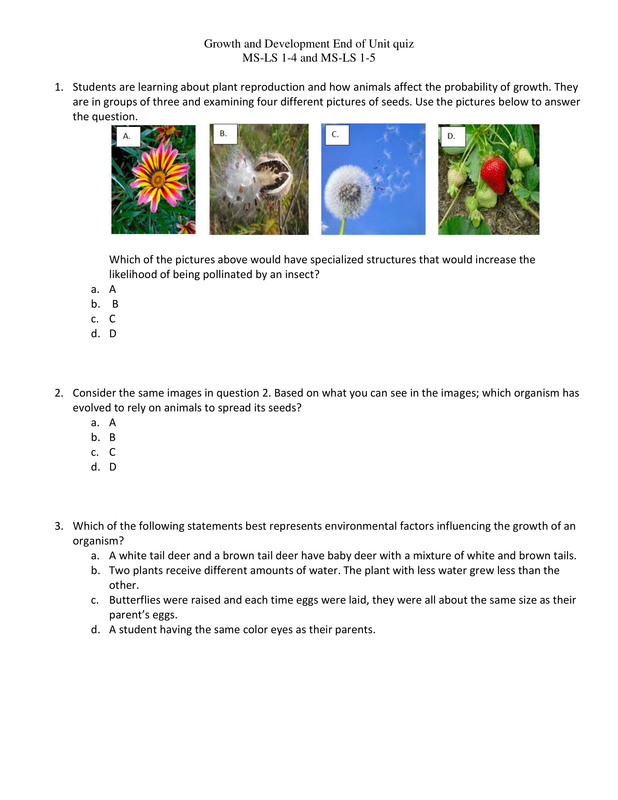 Which of the following statements best represents environmental factors influencing the growth of an organism. A . A white tail deer and a brown tail deer have baby deer with a mixture white and and brown tails. B . Two plants receive different amounts of water. The plant with less water grew less tha the other. C . Butterflies were raised and each time eggs were laid, they were all about the same size as their parent'seggs. D . A student having the same color eyes as their parents. D . Standing out in a crowd. Both plants pictured below are producers and use photosynthesis to make food. There are differences between the two plants even though they carry out the same processes. 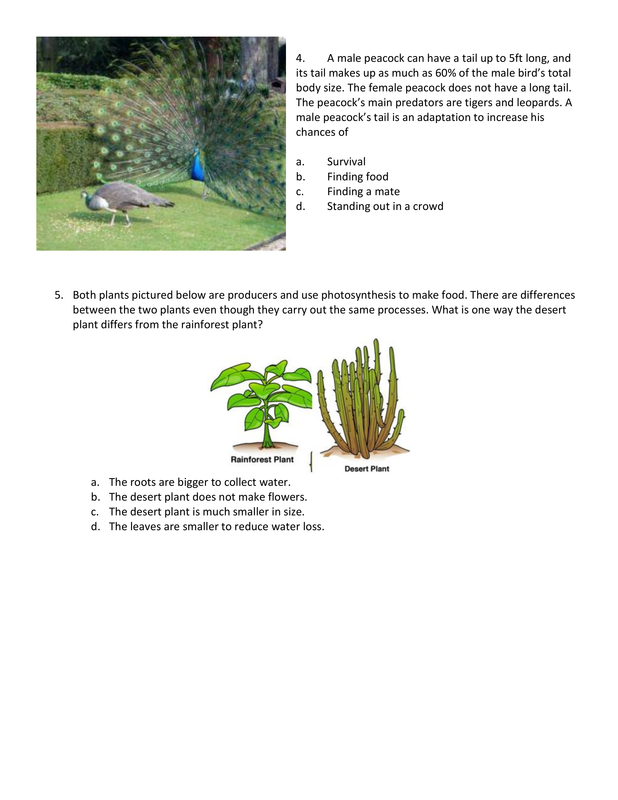 What is one way the desert plant differs from the rainforest plant? A . The roots are bigger to collect water. B . The desert plant does not make flowers. D . The leaves are smaller to reduce water loss. A . Allows the dandelion to grow larger. B . Prevents predators from eating the seeds. C . Makes sure that no seeds grow very far from the parent plant. D . Allows the seeds of dandelions to travel long distances before taking root. Allie collected data on the effects of temperature on the growth of mold. Her results are displayed in the chart below. D . Mold grows best at hot temperatures. Tomato plants grow in warm weaher. If the temperature drops below 32 F for two days in a row, what will most likely happento the tomato plant? C . They will hibernate. The Venus Flytrap plant lives in soil with few nutrients. The plant absorbs nutrients by trapping insects inside it's leaves. The ability of the Venus Flytrap to trap insects is an example of which of the following? Water is necessary for life. During Connecticut winters, the ground freezes, making it difficult for trees to absorb water. How are trees adapted to survive cold winters? B . They reverse the photosynthetic process. C . They drop their leaves and become dormant. 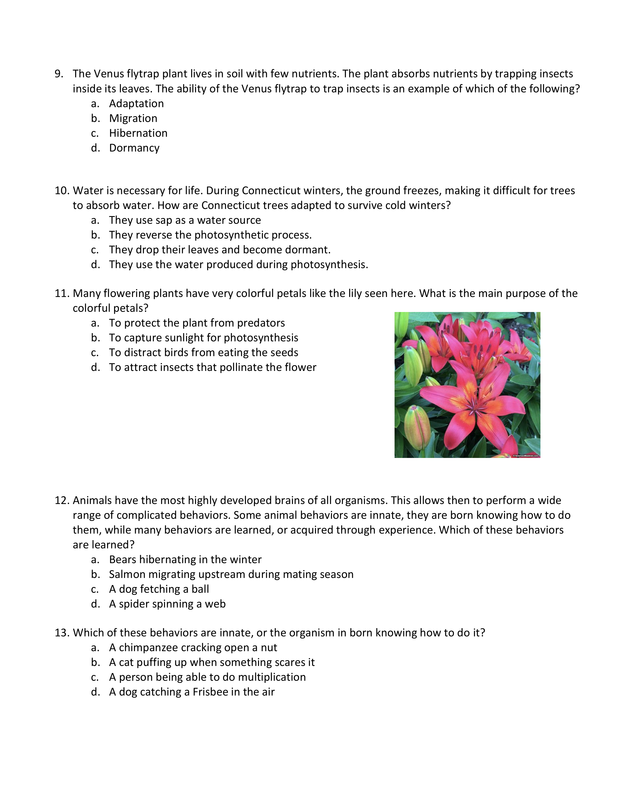 D . They use the water produced during photosynthesis. Many flowering plants have very colorful petals like the lily seen here. What is the main purpose of the colorful petals. A . To protect the plant from predators. Animals have the most highly developed brains of all organisms. This allows them to perform a wide range of complicated behaviors are learned. Some animals behaviofrs are innate, they are born knowing how to do them, while many behaviors are learned, or acquired through experience. Which of these behaviors are learned? D . A spider spinning a web. Which of these behaviors are innate, or the organism is born knowing how to do it? Caribou moss grows on the ground and on rocks 1-4 inches high. The plant goes dormant for a very long time. The stems or stocks are short and low to the ground and hollow. Based on the adaptations described above, where would this plant likely live? The kangaroo rat has a round body with large hind legs and small ears. They are pale tan color and usually have a white spot on their stomachs. Kangaroo rats usually grow to be between 9 and 14 inches long, with most of the length coming fro their tail. Their tail acts a balance point to help them move by hopping on their back legs. The Kangaroo Rat eats only seeds. Kangaroo rats have specialized kidneys which allow them to get rid of waste products without losing water. Kangaroo rats are nocturnal, meaning they move around only at night. 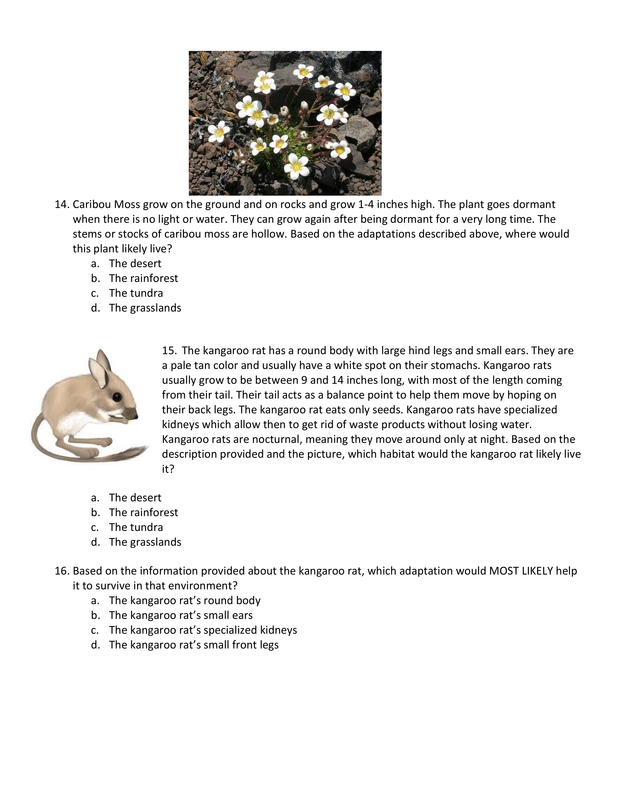 Based on the description proveded and the picture, which habitat would the Kangaroo rat likely live in? Based on the information provided about Kangaroo rats, which adaptation would Most Likely help it to survive in that environment? If a Kangaroo inherited a trait that did not allow it to see well at night, what would be a likely outcome? a. The trait would be passed on to future generations of kangaroo rats because it is helpful to the survival of the kangaroo rat. b. The trait would not be passed on to future generations of kangaroo rats because it is not helpful to the survival of the kangaroo rat. c. The trait may be passed on the future generations of kangaroo rats because it does not affect the survival of the kangaroo rat. d. There is no way to know if this trait will be passed on to future generations. Which of these are an example of an organisms you would expect to reproduce using asexual reproduction? 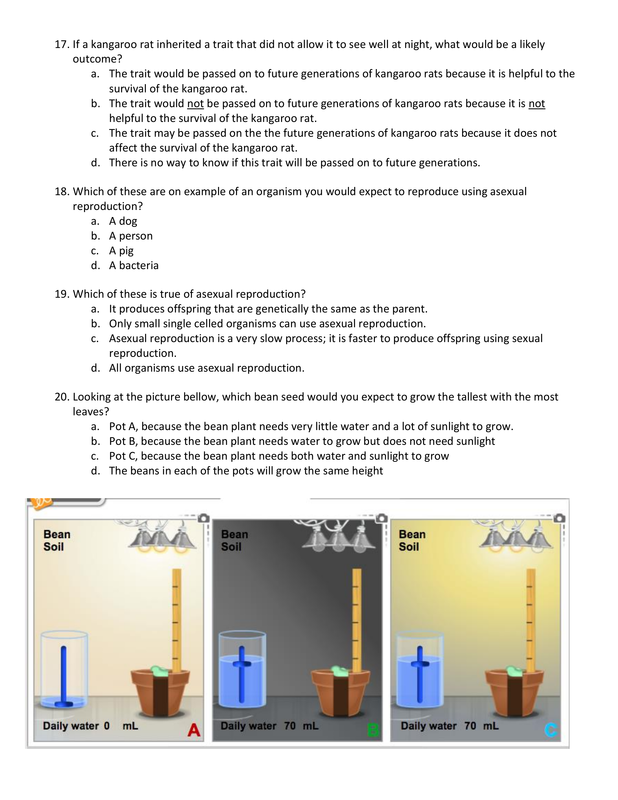 Which of these is true of asexual reproduction? A . It produces offspring that are genetically the same as the parent. B . Only small single celled organisms can use asexual reproduction. C . Asexual reproduction is a very slow process; it is faster to produce offsprirng using sexual reproduction. D . All organisms use asexual reproduction. Looking at the pictuee below, which been seed would you expect to grow the tallest with the most leaves? A . Pot A , because the bean needs very little water and a lot of sunlight to grow. B . Pot B, because the bean plant needs water to grow but does not need sunlight. D . The beans in each of the pots will grow the same height.